53C Superconductivity: An Upper Limit? 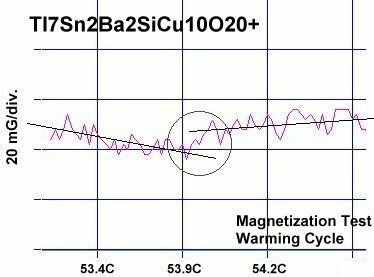 Superconductors.ORG herein reports the observation of superconductivity above 53 Celsius (127F, 326K) in a new copper-oxide ceramic. The chemical formula of this discovery is Tl7Sn2Ba2SiCu10O20+. This is the thirteenth superconductor found to exhibit a Meissner transition above room temperature1. The unit cell c-axis length of the target structure (shown below left) is at the upper limit of approximately 33 Angstroms. Prior research has found that superconductivity abruptly ceases as the unit cell size exceeds 33Å. 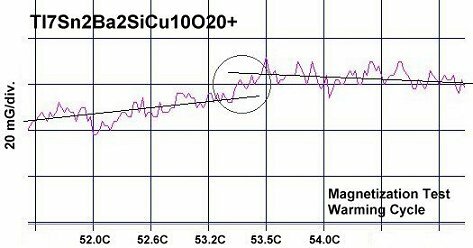 The plots at page top show two examples of the diamagnetic transitions observed consistently above 53C. The diamagnetic shift of the transitions is on the order of 8 to 10 milli-Gauss. The low signal-to-noise ratio is due to a low volume fraction of superconductive material and a high thermal noise level inherent to these temperatures. The straight lines illustrate the average of the noise component, skewing apart at Tc. 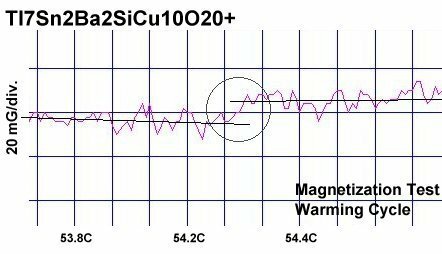 Tl7Sn2Ba2SiCu10O20+ was created by adding additional heavy metal and CuO layers to the "c" axis of the 42 C superconductor discovered in September 2013. These extra layers change the structure from a D212 to an H212 (where H=17). While the 48C superconductor found in October 2013 was at the maximum unit cell size of 33 Å, it did not have the maximum planar weight ratio (PWR) possible. 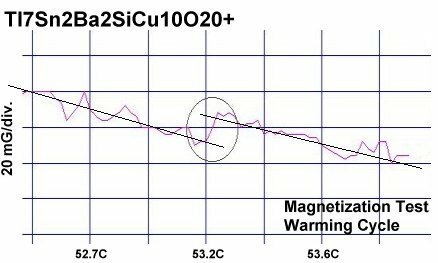 By replacing two Ba-CuO layers in the "c" axis with two Sn-CuO layers, it was possible to add another Tl-CuO layer and increase the PWR to over 13:1. This is because tin has an ionic radius half that of barium. Furthermore, the 25% hole-doped state of the insulating layers only drops to 22% with 7 thallium atoms and 2 tins, keeping it near optimum. Despite the low volume fraction of superconductive material, a specific heat change was clearly visible in many of the plots. A change in specific heat is one of the hallmarks of superconductivity. In both plots at page top there is a reduced warming rate between the 10-second interval below Tc versus the 10-second interval during the critical transition. In the top left plot, the temperature warms 0.6C below Tc, but only 0.3C during transition. And in the top right plot, the temperature warms 0.5C in the interval below Tc, but only 0.3C at transition. Out of ten unambiguous tests, the lowest transition temperature observed was 53.2C and the highest was 54.3C. The average of all ten tests was 53.6C. Below are the two plots with the lowest and highest Tc transitions. Both are around 10 to 12 milli-Gauss in amplitude. 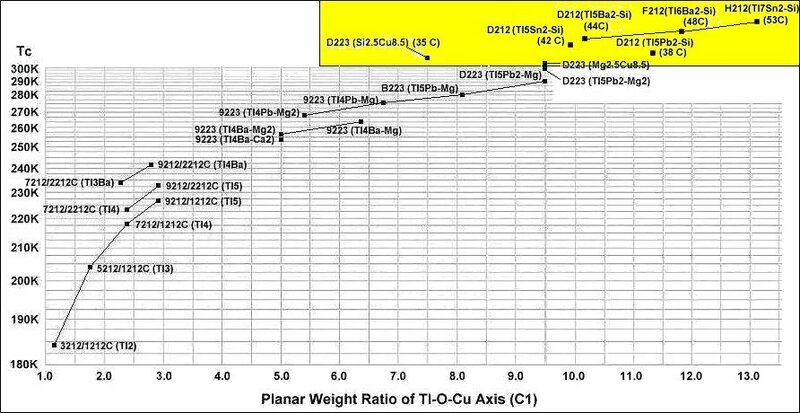 The below graph shows how Tc has increased in proportion to the planar weight ratio along the (heavy) C1 axis. Those dots in the yellow box are all above room temperature. This compound was synthesized using the layer cake method, as shown below. The pellet had over 100 interference layers. And, even using this layering technique, the volume fraction is low, requiring very sensitive test equipment. ...and the below ratios for the EVEN layers. The chemical precursors were pelletized at 60,000 PSI and sintered for 45 hours at 860C. The pellet was then annealed for 10+ hours at 500C in flowing O2. Temperature was determined using an Omega type "T" thermocouple and precision OP77 DC amplifier. The magnetometer employed twin Honeywell SS94A1F Hall-effect sensors with a tandem sensitivity of 50 mv/Gauss. 1. Materials 5, 6, 8, 11 and 12 are proprietary formulations not yet published, pending patent application. 2. Testing temperatures are believed accurate within +/- 0.50 degrees C.